Proteome-wide sampling of function can be used to shed light on complex biological systems. Protein microarrays have now been used to investigate the substrate specificities of essentially all the protein kinases encoded by the yeast genome. The availability of genome sequences from a number of different organisms was recently described as the breakthrough of the year 2000 ; sequenced genomes not only provide new insights into evolutionary relationships, but also offer the real promise of new therapies for diseases that range from the communicable to the genetic. Equally exciting is the emergence from the human genome project of an extraordinarily useful tool: DNA microarray technology. Using 'gene chips', the expression of thousands of genes, from individual cell lines or whole tissues, can be sampled in a single experiment. Although gene-chip technology is certainly very powerful, it is clear that it has limitations. Levels of mRNA often do not correlate with protein expression levels and, furthermore, protein expression levels do not necessarily correlate with protein activity. Clearly, from a cell function point of view, proteomics is where the action is [2,3]. Recently, Snyder and colleagues at Yale University  employed protein chips to examine the substrate specificity of nearly all the protein kinases encoded by the yeast genome. The multidisciplinary nature of this endeavor, which runs the gamut from protein-chip fabrication to high-throughput kinase assays, is shown by the range of author affiliations; the project involved the Departments of Molecular, Cellular, and Developmental Biology, Electrical Engineering, Applied Physics, Cellular and Molecular Physiology, and Molecular Biophysics and Biochemistry. The Yale team  overproduced 119 of the 122 protein kinases encoded by the yeast genome as glutathione S-transferase (GST) fusion proteins, using a 96-well plate format. The GST moiety was incorporated to allow the ready purification of the overproduced protein kinases from endogenous cellular constituents. The three missing protein kinases are encoded by very large genes (up to nearly 9 kb in length): high-molecular-weight proteins are notoriously difficult to express. Another challenge was to overproduce the protein kinases in their active form. For example, the yeast cell clone overexpressing GST-Hog1P, a kinase involved in osmoregulation, was pretreated with high salt just prior to lysis to ensure the formation of the activated enzyme. As many of the other yeast protein kinases are involved in uncharted biochemical pathways, it is possible that they similarly require pre-exposure to a precise set of conditions for full enzyme activity. Given these potential difficulties and uncertainties, it is remarkable that nearly all of the protein kinases encoded by the yeast genome were successfully expressed and isolated, and that the vast majority had recognizable protein kinase activity. The substrate specificities of the 119 GST-protein-kinase fusions were examined in parallel using protein chips, which were fabricated from micro-machined molds over which a silicone elastomer was poured and allowed to cure (Figure 1). Each microwell in the 10 × 14 array is 1.4 mm in diameter, 300 μm in depth and can hold approximately 300 nl. 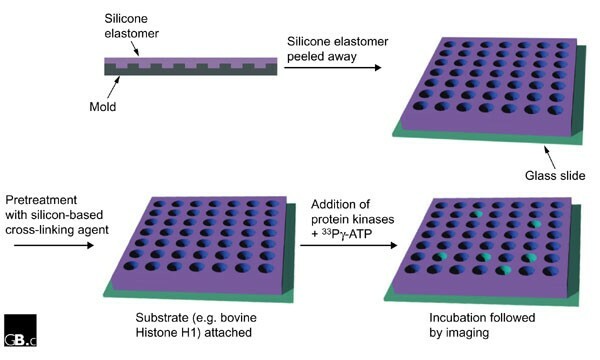 Once the cured elastomer was attached to a glass slide, the wells of the microarray were then pretreated with a silicon-based cross-linking agent so that potential protein kinase substrates could be covalently attached to the silicone elastomer in a spatially segregated fashion. Protein chip fabrication and kinase assay. Silicone elastomer was poured over a mold, and peeled away to produce the chip containing wells. After pretreatment, the chip is ready for the attachment of substrate and kinases. For details of the kinase assay, see the text. The substrate preferences of the 119 GST-protein-kinase fusion proteins were investigated using 17 different substrates, which therefore required 17 separate chips. For example, bovine histone H1, a common protein kinase substrate, was covalently appended to all the microwells of a single chip. The 119 individual GST-protein kinases were then added in a spatially segregated fashion to individual wells of the chip, along with 33Pγ-ATP, and incubated for 30 minutes at 30°C (Figure 1). The chip was washed and a high-resolution phosphoimager was used to quantify the amount of radioactive 33P incorporated into the silicone elastomer-bound histone H1 substrate associated with each microwell. In addition to the histone-H1-containing chip, other protein chips embedded with potential protein kinase substrates, such as casein, the kinases themselves (which could be autophosphorylated), various phosphoproteins, a Tyr-Glu copolymer, and so on, were also prepared. All protein chips contained GST as a negative control as well, so that the phosphorylation signals of each well could be normalized against the GST control. The Yale team  reported a number of interesting findings. Perhaps the most salient was the observation that 112 of the 119 protein kinases examined show a definite selectivity (greater than fivefold relative to background) for at least one substrate. The issue of substrate selectivity was further refined by normalizing the activity of the protein kinases against the average of their activities against all substrates. Even under this more restrictive set of parameters, 32 of the protein kinases show a selectivity of greater than twofold for individual substrates. Indeed, most of the individual substrates are selectively phosphorylated by specific protein kinases and/or sets of protein kinases. For example, Ax12p, a transmembrane secretory protein that localizes to nascent bud tips [5,6], is preferentially phosphorylated by just a handful of the 119 protein kinases examined. One of these kinases, Ste20p, is a member of the p21-activated kinase (PAK) family of protein kinases and its inactivation negatively impacts on budding activity . The observation that Ax12p serves as a strong in vitro Ste20p substrate may therefore provide a glimpse into the signaling pathway responsible for bud emergence and growth in budding yeast. Massively parallel biological screens, be they at the message, protein, or function level, can thus not only provide a global view of the biological system under study, but may also uncover unanticipated behavior and/or functions for specific genes and their protein products that might be difficult to identify by conventional means. Clearly, the results gleaned from the use of any in vitro technology, especially one that is applied to a complex issue such as protein-kinase substrate specificity, may or may not prove to be relevant to the in vivo system. Adaptor proteins, subcellular localization, post-translational modification, and other factors all contribute to substrate specificity. In spite of this caveat, it is tempting to pose the following question: can this technology be used to elucidate protein kinase cascades? This would require examining the ability of each protein kinase to phosphorylate each and every one of the other 121 protein kinases encoded by the yeast genome (which would require a total of 122 chips). Observed substrate preferences could then be used to piece together possible signal transduction pathways. Furthermore, as the Saccharomyces cerevisiae genome contains more than 6,000 open reading frames , one can even imagine preparing a library of chips containing all proteins encoded by the yeast genome (assuming the technology can be automated). The identification of all the native substrates for all members of the yeast protein kinase family will provide a signal transduction 'road map' of the cell, but this is only a first step. Ultimately, it would be useful to address how various environmental stimuli alter proteome-wide enzymatic activity. Equally important, especially in human cell lines, will be the ability to assess the relative differences in global enzymatic activity between different cell types (for example, transformed versus nontransformed). Appropriately formulated protein chips may allow these issues to be examined using lysates from different cell lines and/or from cell lines that have been exposed to an array of different stimuli. At the beginning of the last century, H.G. Wells addressed the Royal Institution of Great Britain . His lecture, entitled 'The Discovery of the Future', concluded with the following words: "It is possible to believe that all the human mind has ever accomplished is but the dream before the awakening." In an analogous vein, the technological advances that have recently emerged offer the promise of unlocking more of nature's secrets in the next few years than have been uncovered in the previous thousand. The work of Snyder and colleagues , as well as recent work of others [10,11,12], provides a partial glimpse of new technologies that will allow us to pose questions that were not even conceivable a few short years ago.